When I was a kid my mom used to read to my brother and I every night before we went to sleep. It was so much fun listening to her soothing voice as we dreamed about dragons, beanstalks and fairy princesses. There was one book in particular that I always made sure to stay awake for from beginning to end. The story was about a little boy and girl who let a mischievous cat wearing an odd red and white striped hat into their home while their mother is away. The boy and girl quickly learn that they should have listened to their pet goldfish’s advice to not let the strange cat in as the cat in the hat begins to wreck havoc in their home. 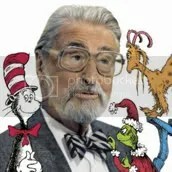 Theodor Seuss-Geisel aka Dr. Seuss was a famous cartoonist and children’s book author who wrote over 60 books throughout his lifetime. Some of his most notable works include: “The Cat in the Hat”, “Horton Hears A Who”, “The Grinch Who Stole Christmas”, and my personal favorite, “Green Eggs and Ham.” Some of his books have even been made into cartoons and major motion pictures. What’s a birthday party without festive party hats? These easy to make Cat in the Hat inspired party hats are just as much fun to make as they are to wear. So let your guests put these hats together themselves. It will not only take the stress off of your shoulders but it will also give your guests a fun activity to do together. Step 1. Take a paper plate and cut the center out leaving the outer ring. This will be the rim of the hat. Step 2. Take an 8.5″ x 11″ piece of white cardstock paper and with a black marker, draw a line every 2″ along the width of the paper. Step. 3. Now starting from the top, color each alternating stripe in with a red crayon or marker (red, white, red, white, red) leaving the bottom stripe blank. Step 4. Next, fold the last stripe along the black line with the flap facing out. Step 5. Tape the flap to the underside of the paper plate ring so that the striped paper is sticking up. 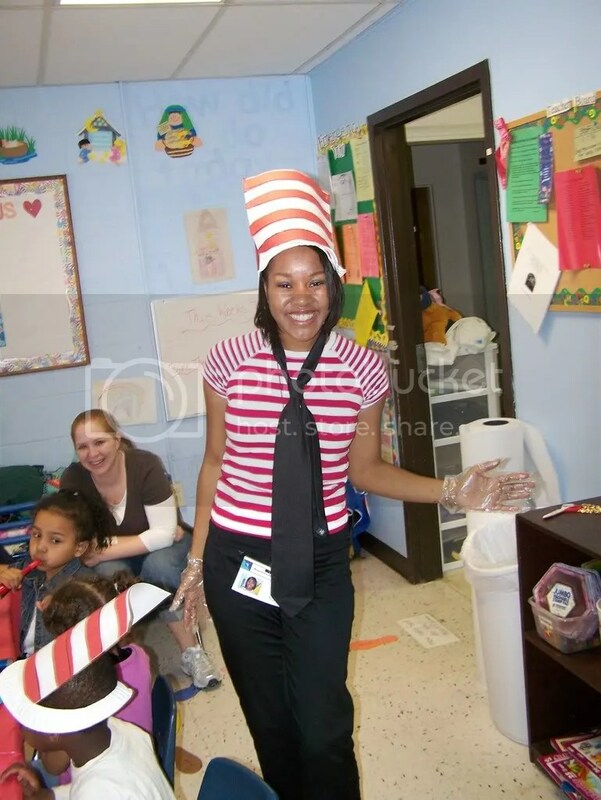 Your head should fit inside the paper plate ring with the striped cardstock sticking up like the Cat in the Hat’s red and white striped hat. To complete the look, you can use black facepaint to give each kid some whiskers! Bake cakes per box directions. You will end up with 6 round cakes but will only need 5 of them to use as tiers for the hat cake. For the filling, whip the heavy whipping cream and sugar in a mixer until the texture becomes thick and fluffy. Fold in the strawberries and jam and set aside. 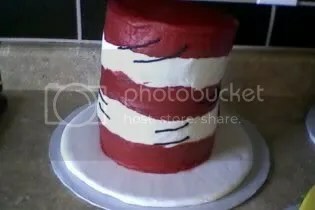 Your white round cardboard base will be the brim of the “hat” and also the base of your cake. Place one tier of the cake in the middle of the cardboard base and spread a layer of strawberry filling over the top of the cake tier. Repeat process for the next four cake tiers: cake, filling, cake, filling, cake, filling, cake. Make sure to leave the top tier of the cake plain. Use icing to decorate each tier in alternating colors of red and white starting from the top tier down: red, white, red, white, red. For a smoother look, use fondant icing instead of whipped icing. Get creative and think of other ways to make it a Seuss-tastic party. How about giving each guest a copy of “The Cat in the Hat” or “The Cat in the Hat Comes Back” book as a party favor? Another idea is to decorate the gift table with a blue tablecloth and place an oversized square cardboard box on top that has been painted to look like a red crate. Cut a hole in the back of the box where the guests can’t see and have someone behind the table place each gift into the box one by one using the hole in the back. Let the birthday boy or girl reach into the red “crate” and pull out each gift to open. It will seem as though the box is bottomless as each time the child reaches in there is another present waiting for them to open. What other ideas can you think of to really Seuss up your kid’s birthday party? Feel free to submit your ideas in the “Comments” section below.